This is a comedy puzzle adventure game with comic book style cut-scenes starring Lucas MacGuffin, a magician turned thief turned werewolf. MacGuffin finds himself cursed and bound to an ancient amulet after bungling a museum robbery. As a human he is agile and able to perform certain tasks, as a huge werewolf he loses his agility but gains brute strength. 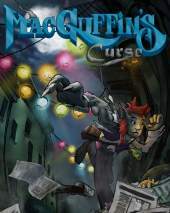 MacGuffin must switch back and forth between being human and being a werewolf via the cursed amulet and moonlight in order to solve puzzles in each area and advance to the next. 150+ Puzzle Rooms - Inspired by classic top-down console adventures, these increasingly mind-bending challenges will push your logical thinking skills to the limit. Challenge Without Frustration - Stuck on a room? P.I. Strump is on the line to help you along (at least between thinly veiled insults) with a seamlessly integrated hint system. 90+ Sidequests - Meet the colourful nightlife of Feyre - a carnival city under curfew - and earn their trust with bizarre, legally questionable favours. Charming Hand-Drawn Art - Collect 50 lavishly-illustrated comic panels to piece together - each expanding on the scandalous secret backstories of key characters. Razor-Sharp Dialogue - With witty banter straight the golden age of point-and-click adventure games, you'll want to chat to every stranger and examine every park bench.